The iconic, leather jacket oozes masculine style but an aged or stiff jacket is less than pleasurable to wear. A leather jacket should stretch until it fits well and complements your body, but it should not hang like a shapeless coat. Renew an old favorite by using a softening technique that will allow you to stretch the jacket to a comfortable shape. Break the stiffness of a jacket by wearing it for one or two hours around the house. The more you wear a leather garment, the more it will stretch. Wear layers of clothing under your jacket to help stretch it out more. Apply leather conditioner to the jacket with a soft cloth. Knead the product into the fabric with your hands. Focus extra conditioner in stiff places like the shoulders or elbows. Wipe away the excess and allow the jacket to rest for 24 hours before wearing it again. Spritz the jacket with water and wear the jacket until it dries. Once the leather dries, it will form to your body. Pull on the leather with both hands to stretch it. Take a few inches at a time then tug one way with your left hand, and pull in the opposite direction using your right hand. Do this several times a week for a better fit. 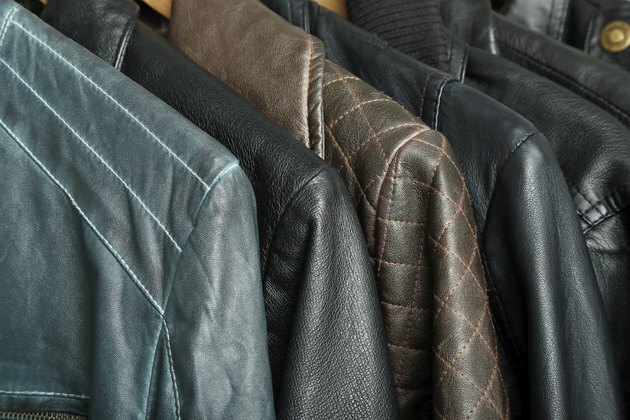 Take the leather jacket to a professional leather worker. These leather companies have special products for treating rough fabrics. Lambskin is a soft leather choice but it does not stand up to stretching well. Many leather companies now sell leather wear that has undergone some type of treatment process that makes the jacket supple and ready-to-wear. Using a washing machine for stretching could damage your leather.